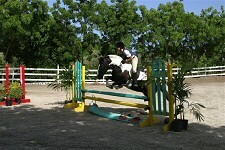 The Stables at Springhill in Falmouth are very close to several beaches and to the historic sites of English Harbour. Ride in the cool of the morning and explore the rest of English Harbour in the afternoon. 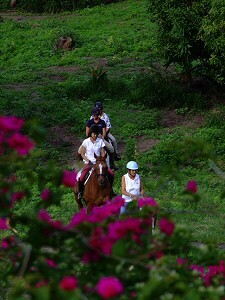 We offer some wonderful trail rides through the hills with scenic views, or treks to the beach with the opportunity to swim with your horse in the warm waters of this Caribbean island. Our most popular ride is an hour’s gentle trek around our beautiful valley, with a wonderful splashy wade through the water in Falmouth Bay – cool with great views, and photo ops. All our rides are private with a maximum of 4 riders. All rides leave our stables at 8.30am, Trail rides go out Monday through to Saturday mornings and advanced booking is highly recommended. Private Lessons in Dressage and Show Jumping are also only a phone call away. If you are feeling adventurous, and are a competent, English saddle rider, then wild Rendezvous Bay with its’ glorious un-spoilt beach is how you always imagined the Caribbean to be. We would need to know the approximate weight, age & ability of each rider. All riders ride at their own risk, although we do carry insurance, we would need you to sign a waiver. Our insurance requires that you wear the light weight, aerated helmets that we provide. You will be more comfortable in long pants, or leggings and you will need proper shoes, not flip flops. GETTING HERE: If you are staying on the island, we suggest that you rent a car for the day that you wish to ride, and take advantage of being in our historic area and explore the many interesting and beautiful ruins of English Harbour and Shirley Heights. In the season, you can admire the amazing yachts in Falmouth. There are also some great restaurants and bars in the area for lunch, dinner or just a drink or a cappuccino. Going home you could drive down scenic Fig Tree Drive to the West coast beaches. It takes between 30 – 40 minutes maximum to get to Spring Hill from anywhere on the island. If you are coming to Antigua by Cruise ship, check on the arrival time of the ship, and you can book a taxi on line at www.antiguanice.com, or grab a taxi from the cruise ship dock.